The rest of the year, she says, they often search for the best fabrics, a critical element to the quilting hobby, which is not lost on Eckhardt. For a decade or so, she talked with her husband, Joe, about her wish to someday open and run her own quilt shop. The idea took shape, in January 2015 as she recuperated from having her wisdom teeth pulled, and had time to reflect on her dream. It occurred to her again as she prayed and read her Bible during the early morning of an icy February day that same year. The dream of opening a quilt shop didn’t seem so far-fetched to Eckhardt. She reasoned that in Montana, residents are used to driving long distances, and that women who are skilled and dedicated quilters would travel to Lewistown if they knew a quality quilt shop was there. These ideas remained vague until she participated in a workshop called Recharge Our Community (ROC). Part of the Rural Community Assistance Corporation’s (RCAC’s) Building Rural Economies (BRE) program, ROC workshops increase local entrepreneurship and jobs in rural communities and build residents’ capacity to network, plan and implement economic development. BRE helps rural residents develop catalytic projects that seed additional investments. According to Pam Higgins, RCAC rural planning and capacity building manager, the Lewistown participants came from every part of the community. One of those graduates was Eckhardt. Tammy Eckhardt, owner/operator of Sew Pieceful. A Facebook page grew out of those survey questions, Eckhardt said, and Lewistown eventually branded itself as the Heart of Montana. Workshop participants also began several civic projects, including an outdoor stage called the Creekside Pavilion that will host summer concerts and Shakespearian plays. Another business, Big Spring Brewing, has also taken off—“It’s packed every single night,” Eckhardt says. In the recruitment process, RCAC trainers applied the WealthWorks “Eight Forms of Capital,” explained Higgins. WealthWorks is an approach to local and regional economic development that explores community assets and how they can meet market demands. It aims to expand a region’s economic prosperity and self-reliance, strengthening existing and emerging sectors to increase individual and community wealth. In Lewistown, explained Higgins, participants considered individual, financial, political, intellectual, social, natural and cultural capitals and also value chains. WealthWorks regional hubs have developed value chains such as agriculture, tourism, manufacturing, labor, downtown revitalization and the energy sector and include public sector entities, nonprofit organizations, entrepreneurs, colleges, universities, consumer groups and individuals. “The finance value chain re-started the Lewistown Port Authority to work with new business,” she said. “Tourism has worked to develop tourism maps and promotions for Lewistown. The youth engagement value chain has developed the Creekside Marketplace and Pavilion. According to Amity Rembold, RCAC rural development specialist for economic development through the BRE, several businesses launched and 46 jobs were created, including: two positions for Trinity Construction; five for Sew Pieceful; two for Benchmark Masonry; and 37 for the Central Feed Grilling Company. Meanwhile, Eckhardt continued to think more concretely about her own plans for a quilting store. 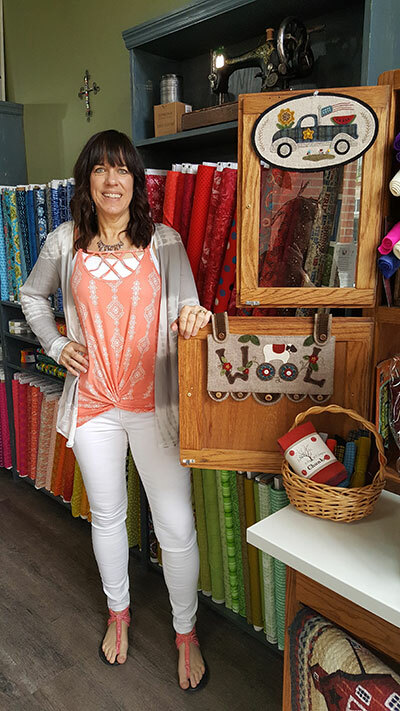 In 2016, she finally opened the doors to the cleverly named “Sew Pieceful” along Lewistown’s Main Street. But, she learned more about entrepreneurship and how to grow her business in the two years since then. Her customers clearly recognize her consideration and service too. 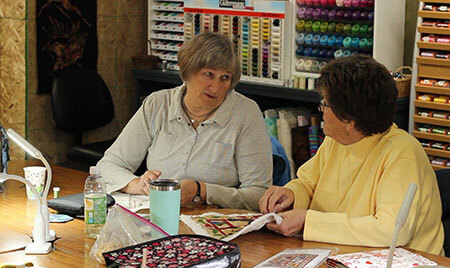 Customers enjoying sewing time at the Sew Pieceful quilt shop. With such support, Eckhardt recently followed through on her expansion plans. This included adding a 12-foot long machine called a Handi Quilter Longarm, which is used to stitch together quilt tops. Eckhardt also added on another six small rooms to the 2,200 square-foot store where she could teach quilting. Alongside fabrics and sewing machines, she also now sells completed quilted products. “I can now pay an employee to be there every single day,” she says, noting that she has five part-time employees, who also receive high praise from customers. The average age among Eckhardt’s customers is 65, but she has noticed a surge in younger women coming to the craft. Moreover, she has observed in practice what she had considered in theory—that a quilter will often travel a ways to find good fabric. Even further afield is a loyal customer from Denmark. 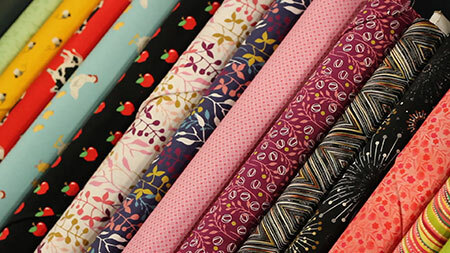 They come, she says, because Sew Pieceful is a warm and inviting place, where the fabrics provide kaleidoscopic vibrancy. Displays include attractively upholstered chairs and pillows, as well as color schemes that even the most advanced quilters may not have considered. All photos were taken by Dustin Love, RCAC publications & graphic design specialist.